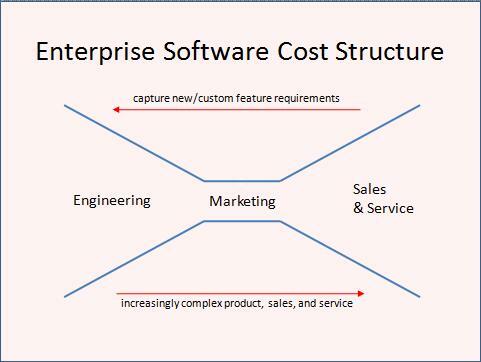 Below is what I would characterize as the typical enterprise software company cost structure. 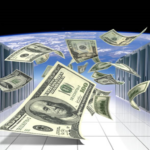 This model is no accident, and it has proved to be immensely profitable over the last 20 years (just ask Oracle and Microsoft). It is characterized by drivers that work synergistically to create the whole: perpetual license pricing, feature competition, solution selling and customization. All of these characteristics (and their ensuing complexity and costs) derive from the underlying buyer belief that the system will deliver some level of competitive advantage. While this may have been true 20 years ago, and may still be true for some fundamental business processes, it is patently untrue for 90% of most IT infrastructure today. Hence the rise of SaaS and Open Source. Unfortunately, the preceding paradigm is a self-reinforcing business model that naturally evolves toward this equilibrium. It is incredibly difficult to break out of economically and culturally. 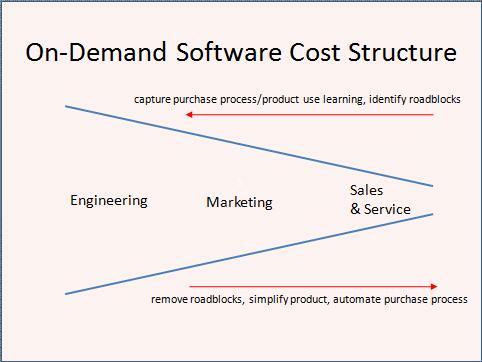 Below is what I am proposing to be the natural equilibrium cost structure of a well run on-demand software business. 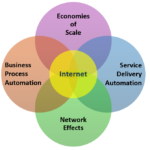 This SaaS business model is equally self-reinforcing and composed of a number of drivers that work together synergistically: subscription-based pricing, product simplicity, and the continuous automation and integration of marketing, sales and service processes throughout the product and the company’s overall Web presence based on catalytic learning. By catalytic learning, I mean that while sales and marketing still have the tactical role of closing everyday business, they also have strategic role of structuring the purchase process, identifying roadblocks and eliminating them through product-based and Web-based automation. There should be very little division between the product and the company’s overall Web presence–they should be seamlessly integrated into a single, highly-automated customer experience. For example, if a customer is forced to pick up a phone or send an e-mail to talk to a person in order to try, buy, deploy, integrate or maintain your product, then your business is not truly on-demand will be bleeding cash from the higher labor costs. I will also propose that a company is better off starting with this cost structure from the get-go and resisting the urge to chase revenue by adding excessive direct labor resources to the sales and marketing process. Doing so merely undermines the culture required to build a successful on demand business. Labor should be highly leveraged through product and the Web automation, so before adding a high-touch resource to hold a customer’s hand directly, you should look for Web/product-based solutions to remove roadblocks to demand generation, trial, close, and use.